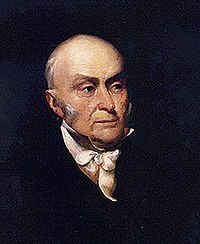 John Quincy Adams (July 11, 1767 – February 23, 1848) was an American lawyer, diplomat, politician, and President of the United States (March 4, 1825 – March 4, 1829). His party affiliations were Federalist, Democratic-Republican, National Republican, and later Whig. Adams was the son of U.S. President John Adams, and Abigail Adams. He is most famous as a diplomat involved in many international negotiations, and for formulating the Monroe Doctrine. As president he proposed a grand program of modernization and educational advancement, but was unable to get it through Congress. Late in life, as a Congressman, he was a leading opponent of the Slave Power, arguing that if a civil war ever broke out the president could abolish slavery by using his war powers, a policy followed by Abraham Lincoln in the Emancipation Proclamation of 1863. Adams was born in Braintree, Massachusetts in a part of town which eventually became Quincy. The John Quincy Adams birthplace, now part of Adams National Historical Park, is open to the public, as is the nearby Abigail Adams Cairn that marks the site from which Adams witnessed the Battle of Bunker Hill as a seven-year-old boy. Much of Adams' youth was spent overseas accompanying his father, who served as an American envoy to France from 1778 until 1779 and to the Netherlands in 1780. During this period, he acquired his early education at institutions such as the University of Leiden. After returning to America, he entered Harvard College and graduated in 1787. He was then admitted to the bar and began practicing law in Boston, Massachusetts. George Washington appointed Adams as minister to the Netherlands from 1794 until 1796 and to Portugal in 1796. With George Washington's urging, his father appointed him minister to Prussia from 1797 until 1801. While serving abroad, he married Louisa Catherine Johnson, the daughter of an American merchant. Adams afterwards returned to Quincy where he lived in the Old House (now a museum). He began his political career in 1802 when he was elected to the Massachusetts Senate. Adams was an unsuccessful Federalist candidate for election to the U.S. House of Representatives in the same year. He was elected as a Federalist to the U.S. Senate, serving from March 4, 1803, until June 8, 1808, when he broke with the Federalists and became a Republican. Adams served as minister to Russia from 1809 until 1814, chief negotiator of the U.S. commission for the Treaty of Ghent in 1814, and minister to the Court of St. James (Great Britain) from 1815 until 1817. Adams served as Secretary of State in the Cabinet of President James Monroe from 1817 until 1825, a tenure during which he was instrumental in the acquisition of Florida. Typically, his views were concurrent with those espoused by Monroe. As secretary of state, he negotiated the Adams-Onís Treaty and wrote the Monroe Doctrine, which cautioned European nations against meddling in the affairs of the Western Hemisphere. Adams ran against three other candidates in the Presidential election of 1824. His opponents included Speaker of the House Henry Clay, Secretary of the Treasury William H. Crawford, and Tennessee senator Andrew Jackson. After Crawford suffered a stroke there was no clear favorite. After the elections no one had a majority of either the electoral votes or the popular votes, although Andrew Jackson was the winner of a plurality of both. The decision went to the House of Representatives. The candidate with the lowest votes, Henry Clay, was dropped from consideration, and Clay gave his support to Adams. Adams won on the first ballot and was named president. Adams then named Clay Secretary of State to the angry complaints of Andrew Jackson, who alleged a corrupt bargain and vowed to run again in 1828. Adams served as the 6th President of the United States from March 4, 1825 to March 4, 1829. He became president at the end of an era known as the "Era of Good Feelings", as political rhetoric again became vituperative. During his term, he worked on developing the American System. In his first annual message to Congress, Adams presented an ambitious program for modernization that included roads, canals, a national university, an astronomical observatory, and other initiatives. The support for his proposals was limited, even with his own supporters. His critics accused him of unseemly arrogance because of his narrow victory. Most of his initiatives were opposed in Congress by Jackson's supporters, who remained outraged over the 1824 election. One of the issues which divided the administration was protective tariffs. Henry Clay was a supporter, but Adams's Vice President John C. Calhoun was an opponent. The position of Adams was unknown, because his constituency was divided. After Adams lost the control of Congress in 1827, the situation became more complicated. He and Clay set up a new party, the National Republican Party, but it never took root in the states. In the elections of 1827 Adams and his supporters lost the control of Congress. Senator Martin Van Buren, a future president and follower of Jackson, became one of the leaders of the senate. Adams is regarded as one of the greatest diplomats in American history and during his tenure as Secretary of State he was one of the designers of the Monroe Doctrine. But during his term as president, Adams achieved little of consequence in foreign affairs. One of the reasons for this was the opposition in Congress. Rivals in Congress were determined to deny him any mark of success. For example, when the new Latin American republics, formerly Spanish colonies, convened a congress to promote cooperation in the Western Hemisphere, they invited Adams to send delegates. Congress denied him the money to do so. But thanks to the Monroe Doctrine, most of the issues in foreign affairs were resolved by the time Adams became President. After the election of Adams in 1825  , Jackson resigned from his senate seat. For four years he worked hard, with help from his supporters in Congress, to defeat Adams in the Presidential election of 1828. The campaign was very much a personal one. Although neither candidate personally campaigned, their political followers organized many campaign events. Both candidates were rhetorically attacked in the press. This reached a low point when Jackson's wife, Rachel, was accused of bigamy. She died a few weeks after the elections and Jackson never forgave Adams for this. In the end, Adams lost the elections in a landslide. He won exactly the same states that his father had won in the election of 1800: the New England states, New Jersey, and Delaware. Jackson won everything else except for New York, which gave 16 of its electoral votes to Adams. After his defeat Adams didn't attend the inauguration of his successor Andrew Jackson, just as his father John Adams did 28 years earlier with Jefferson's in 1801. But rather than retire, he went on to win election as a National Republican and Whig to the House of Representatives, serving from 1831 until his death. He was asked by his neighbors to run, and he agreed under two conditions: he would never solicit their votes and he would follow his conscience at all times. In congress, he was chairman of the Committee on Manufactures (for the 22nd through 26th, 28th and 29th Congresses), the Committee on Indian Affairs (for the 27th Congress) and the Committee on Foreign Affairs (also for the 27th Congress). He was an important antislavery voice in congress. In 1834 he was an unsuccessful candidate for governor of Massachusetts. In 1841, Adams represented the Amistad Africans in the Supreme Court of the United States and successfully argued that the Africans, who had seized control of a Spanish ship where they were being held as illegal slaves, should not be taken to Cuba but should be considered free and have the option to remain within the U.S. or return home as free people. Adams died of a cerebral hemorrhage on February 23, 1848, in the Speaker's Room inside the Capitol Building in Washington, D.C.. His interment was in the family burial ground at Quincy, and he was subsequently reinterred after his wife's death in a family crypt in the United First Parish Church across the street. His tomb can be viewed today and his parents are also interred there. Adams's son Charles Francis Adams also pursued a career in diplomacy and politics. In 1870 Charles Francis built the first memorial presidential library in the United States, to honor his father John Quincy Adams. The Stone Library includes over 14,000 books written in twelve languages. The library is located in the "Old House" at Adams National Historical Park in Quincy, Massachusetts. Adams was the first president to have a close family tie to a previous president. Benjamin Harrison was the grandson of William Henry Harrison, Franklin Delano Roosevelt and Theodore Roosevelt were cousins, and George H.W. Bush and George W. Bush are also father and son. Adams was one of the founders of All Souls Church, Unitarian, in Washington, D.C.
Adams was the first president to wear long pants instead of knee-breeches, which had been the fashion up to that time. The couple named one of their sons after George Washington, making Adams the only U.S. President to do so. Adams posed for this photograph shortly before his death in 1848--almost twenty years after leaving the White House--when he was serving as a congressman from Massachusetts. He is the earliest president of whom we have a photograph. (President Andrew Jackson was photographed in 1844-45; James Buchanan was the first president to be photographed while in office. Adams was the first President to give an interview to a woman. Adams had repeatedly refused requests for an interview with Anne Royall, the first female professional journalist in the U.S., so she took a different approach to accomplish her goal. She learned that Adams liked to skinny-dip in the Potomac River almost every morning around 5 AM, so she went to the river, gathered his clothes and sat on them until he answered all of her questions. While in Russia, Adams and his wife lost an infant daughter, who was born in 1811, to illness. Toilets, a novelty during his term, were given the nickname "Quincy" in honor of the late president. The president was the first to have such a convenience installed in the White House. Adams County, Illinois and its county seat Quincy, Illinois is named after him, along with several other counties in the U.S..
JQ Adams is one of only two presidents to publish verse in his lifetime. The other was Jimmy Carter. Dermot MacMurrogh, an epic poem, about Henry IIs conquest of Ireland in which he subtly associated the Roman Catholic Church with English aggression was published in 1832. Poems of Religion and Society, a collection of lyrical poems was published in 1848. The actress Mary Kay Adams is a descendant of John Quincy Adams. In the film How High, Jamal King and Silas P. Silas dig his remains from his grave and attempt to smoke him to gain knowledge to pass tests, but to no avail. The "c" in Adams's middle name "Quincy" is properly pronounced with the z sound, not the s sound, just like the city of Quincy, Massachusetts, and Quincy Market in Boston (names derived from the same family). He is the first of the 8 senators profiled in John F. Kennedy's Profiles in Courage. His last words were "This is the last of earth. I am content". Allgor, Catherine. "'A Republican in a Monarchy': Louisa Catherine Adams in Russia." Diplomatic History 1997 21(1): 15-43. Issn: 0145-2096 Fulltext in Swetswise, Ingenta and Ebsco. Louisa Adams was with JQA in St. Petersburg almost the entire time. While not officially a diplomat, Louisa Adams did serve an invaluable role as wife-of-diplomat, becoming a favorite of the tsar and making up for her husband's utter lack of charm. She was an indispensable part of the American mission. Crofts, Daniel W. "Congressmen, Heroic and Otherwise" Reviews in American History 1997 25(2): 243-247. Issn: 0048-7511 Fulltext in Project Muse. Adams role in antislavery petitions debate 1835-44. Miller, Chandra. "'Title Page to a Great Tragic Volume': the Impact of the Missouri Crisis on Slavery, Race, and Republicanism in the Thought of John C. Calhoun and John Quincy Adams." Missouri Historical Review 2000 94(4): 365-388. Issn: 0026-6582 Shows that both men considered splitting the country as a solution. Portolano, Marlana. "John Quincy Adams's Rhetorical Crusade for Astronomy." Isis 2000 91(3): 480-503. Issn: 0021-1753 Fulltext online at Jstor and Ebsco. He tried and failed to create a national observatory. Potkay, Adam S. "Theorizing Civic Eloquence in the Early Republic: the Road from David Hume to John Quincy Adams." Early American Literature 1999 34(2): 147-170. Issn: 0012-8163 Fulltext online at Swetswise and Ebsco. Adams adapted classical republican ideals of public oratory to America, viewing the multilevel political structure as ripe for "the renaissance of Demosthenic eloquence." Adams's Lectures on Rhetoric and Oratory (1810) looks at the fate of ancient oratory, the necessity of liberty for it to flourish, and its importance as a unifying element for a new nation of diverse cultures and beliefs. Just as civic eloquence failed to gain popularity in Britain, in the United States interest faded in the second decade of the 18th century as the "public spheres of heated oratory" disappeared in favor of the private sphere. Rathbun, Lyon. "The Ciceronian Rhetoric of John Quincy Adams." Rhetorica 2000 18(2): 175-215. Issn: 0734-8584. Shows how the classical tradition in general, and Ciceronian rhetoric in particular, influenced his political career and his response to public issues. Adams remained inspired by classical rhetorical ideals long after the neo-classicalism and deferential politics of the founding generation had been eclipsed by the commercial ethos and mass democracy of the Jacksonian Era. Many of Adams's idiosyncratic positions were rooted in his abiding devotion to the Ciceronian ideal of the citizen-orator "speaking well" to promote the welfare of the polis.